Thanks for the nice comments on my last entry! I promise I will write more on learning theory as it applies to knitting at some point, maybe after I’m done squeezing every last drop of academic knowledge out of my brain in order to survive the rest of this semester. I’m actually dying, DYING, I say! to run a study evaluating childhood knitting instruction on spatial skills, math skills, fine motor coordination, all that good stuff, and see if, like all knitters believe, it actually makes a difference. But that will have to wait for a day when I have my own lab and research funding, because I really don’t see getting that one past my dissertation committee. But in the meantime, let’s talk oddballs. Like anybody who’s been knitting for a while, I’ve accumulated quite an oddball stash. 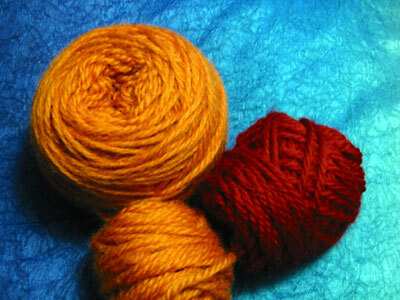 In fact, based on my updated yarn inventory, 4500 yards of my current stash are oddballs. That’s 2.5 miles of yarn, for people who are keeping track. I’m probably luckier than most knitters, in that a significant chunk of my oddball stash comes in the form of three different yarns: 700 yards of Fortissima Socka, 600 yards of Elann Peruvian Highland Wool, and 950 yards of Cascade 220, leftover from many socks, the Ombre Blanket, and assorted felted items. That said, the small and weird amounts left in sometimes-clashing colors still doesn’t make for easy re-combining of yarn to make a new project. Unless it’s a baby project. But who wants a baby item that’s 100% non-superwash wool? …are going to stop uselessly taking up space in my stash, and go usefully off to make some nice Afghani child’s head nice and warm. It’s a good system, I think. CogKnition posted this on March 29th, 2007 @ 7:01pm in Knitting for Charity, Life as a Knitter, Yarn | Permalink to "Oddballs, Begone!" Those look like Gryffindor colors! That’s actually a really great way to use up some stash yarn – I’d been planning on starting a log cabin blanket for mine, but your idea is even better!